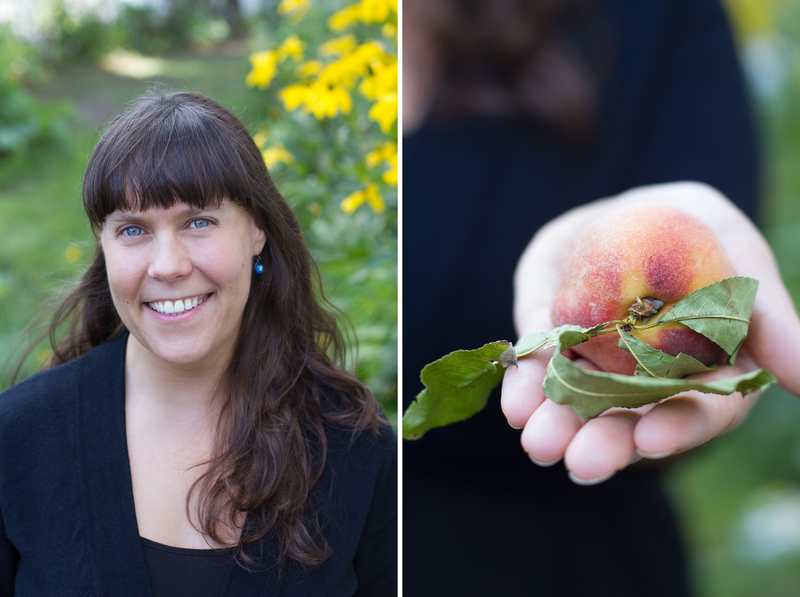 "i love this time of year, when hot summer sun means gardens everywhere are lush with edibles. growing up on an organic vegetable garden in wisconsin, i had my pick of fresh produce to cook with, canning dill pickles, tomatoes, and baking strawberry rhubarb pie 'til the cows came home (okay, there were no cows on our farm). i've been lucky enough to continue my "farmer's daughter foodie" tradition since moving to boston with a fruitful backyard garden and multiple local farmer's markets. 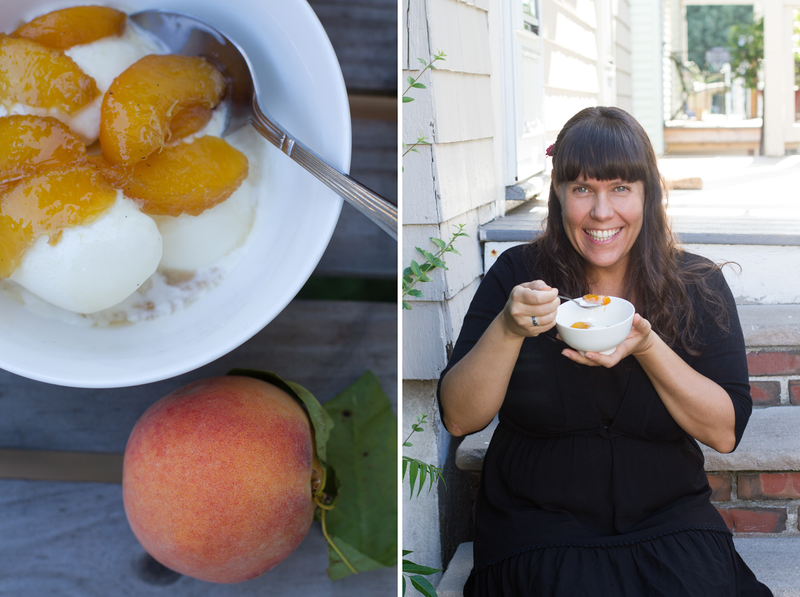 imagine my happy surprise when i discovered that peaches grow in massachusetts! peaches were a rare treat when i was a kid, as they weren't local or cheap. i think my favorite season here begins when the peaches come in at the farmer's market, and i take advantage by baking peach pies, canning slices in honey syrup, making peach lemonades, and doing just about anything and everything else i can with them while they're here. 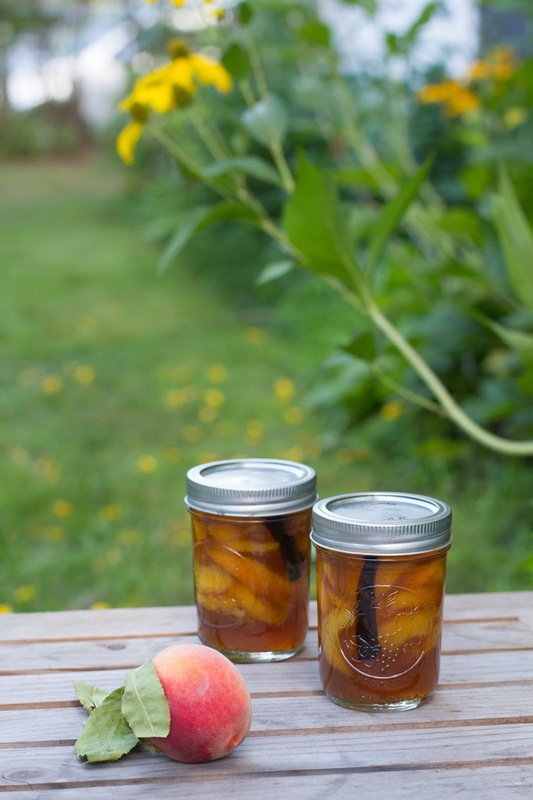 one of my favorite recipes is vanilla bean bourbon poached peaches. they're even yummier than they sound!" 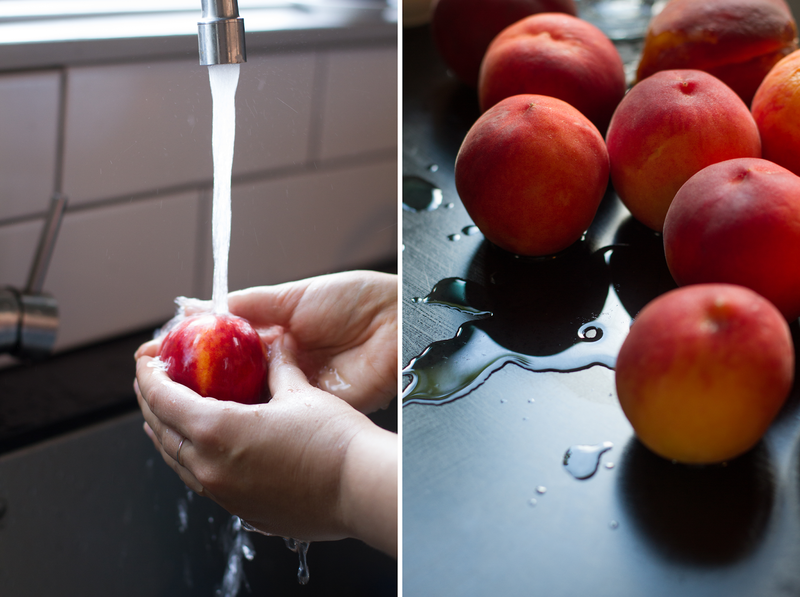 gently hand wash the peach fuzz off in cold running water and twist stems off, then cut a large x on the bottom (non-stem end) of each peach. bring a large pot of water to a boil. while waiting for that, prepare an ice water bath of a large bowl filled with ice and cold water. 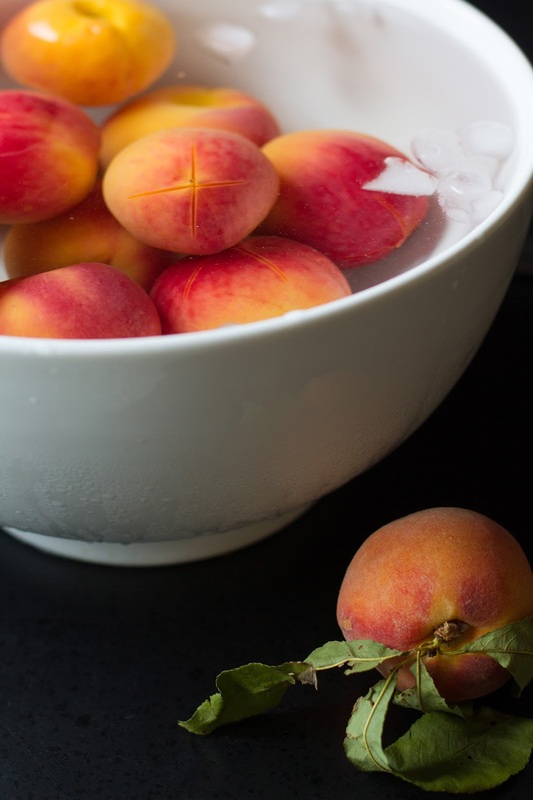 to peel the peaches, drop them into boiling water using a slotted spoon, for 1 to 1 1/2 minutes (if peaches are not quite ripe, more time is needed), then quickly transfer them to the ice water bath to cool for a few minutes. you should start to see the edges of the x you cut curling up so you can easily peel the skins off. 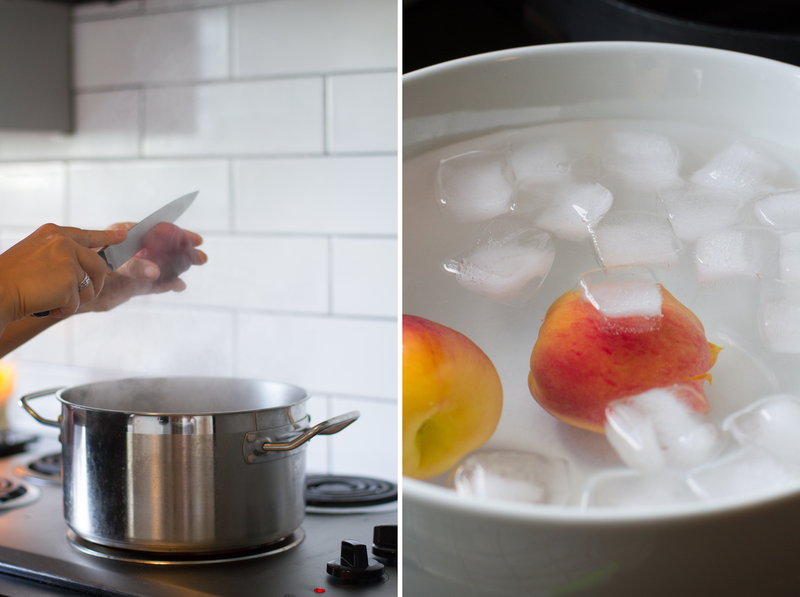 it's easier to do a couple peaches at a time, rather than all at once, to ensure the ice water stays very cold. once all are peeled, slice and pit peaches, and put aside in a bowl. 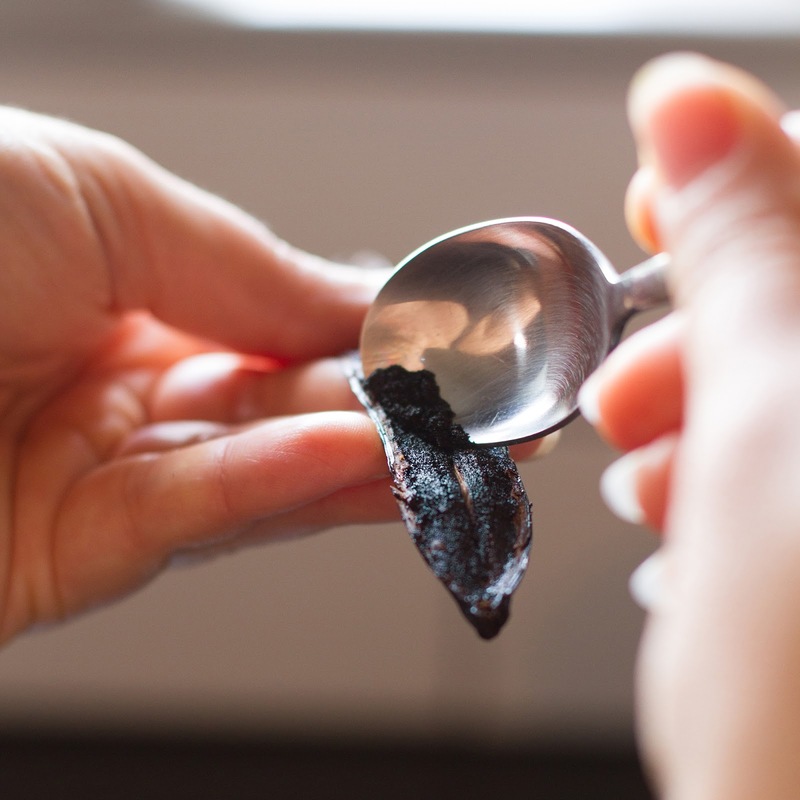 bring 4 cups water, the sugar, the scraped vanilla seeds, and the pods to a boil in a large saucepan, stirring often until the sugar dissolves. 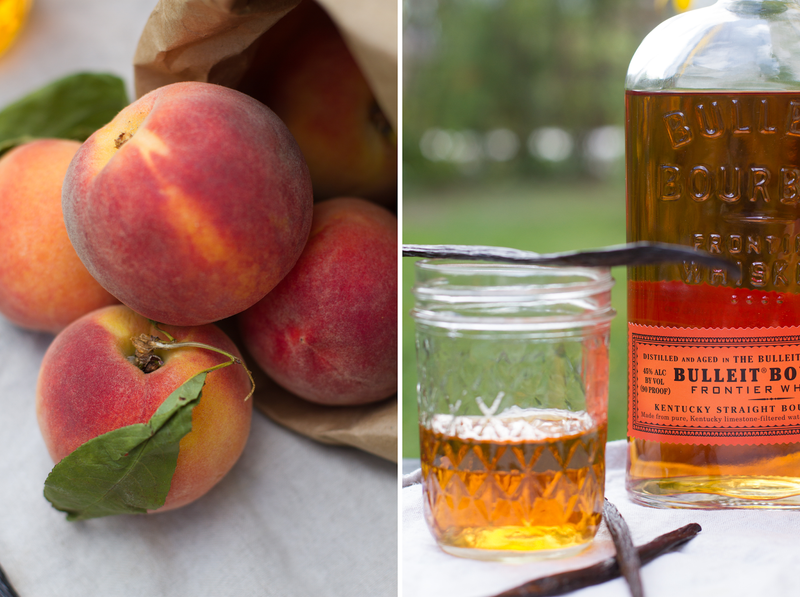 turn heat down to a simmer, and add the sliced peaches and bourbon. cook until peaches are tender, but still hold their shape, about 5-7 minutes. it's important to keep a steady but low simmer at this point, to avoid boiling off the bourbon. 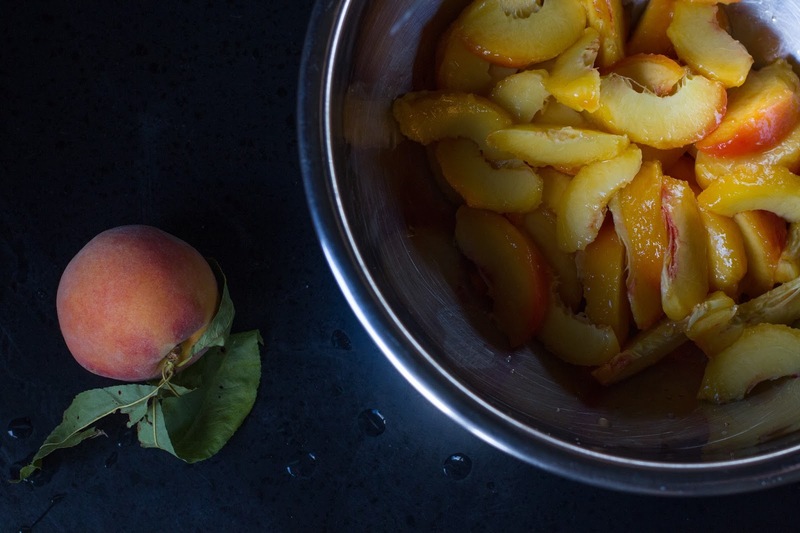 once peaches are tender, remove them with a slotted spoon and set aside in a large bowl. continue to cook the syrup over medium heat until it's reduced to about half, or roughly 15 minutes. the syrup will be delicious at any stage here (and will taste more bourbon-y) if you choose to not cook it down further, but it will thicken and have a deeper flavor if cooked down as directed. 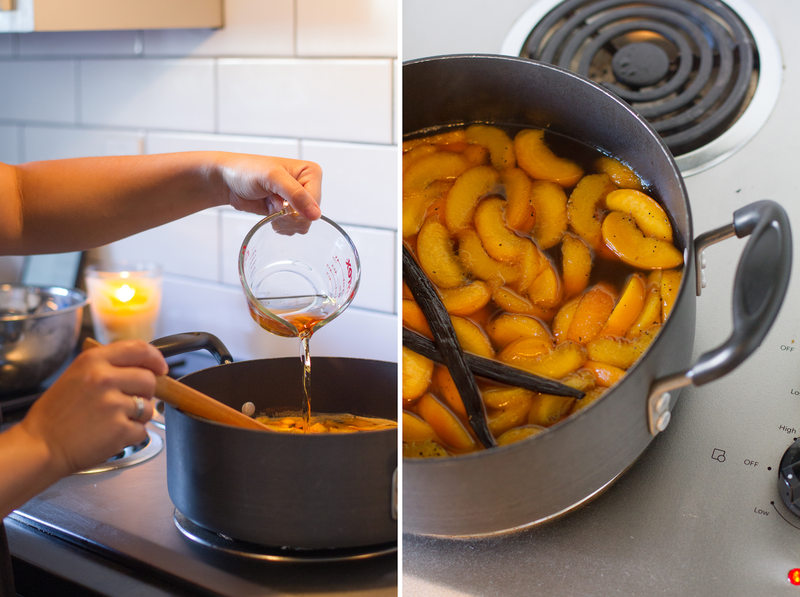 once syrup is finished, pour it over the peaches, and let set and cool completely. 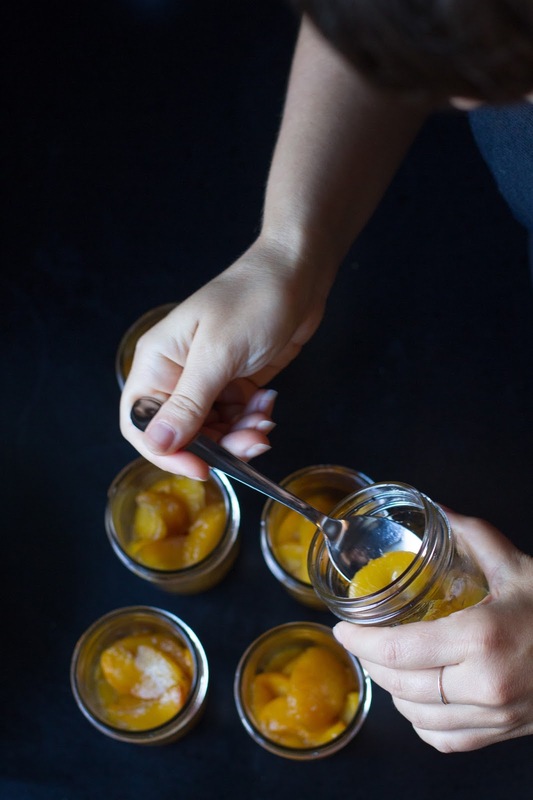 divide peaches among 6-8 half pint/8 oz glass jars that have been sterilized. jars can be sterilized by boiling in water, submerged, for 10 minutes, or run through a hot dishwasher cycle. if desired, add slices of the vanilla bean pods to each jar. 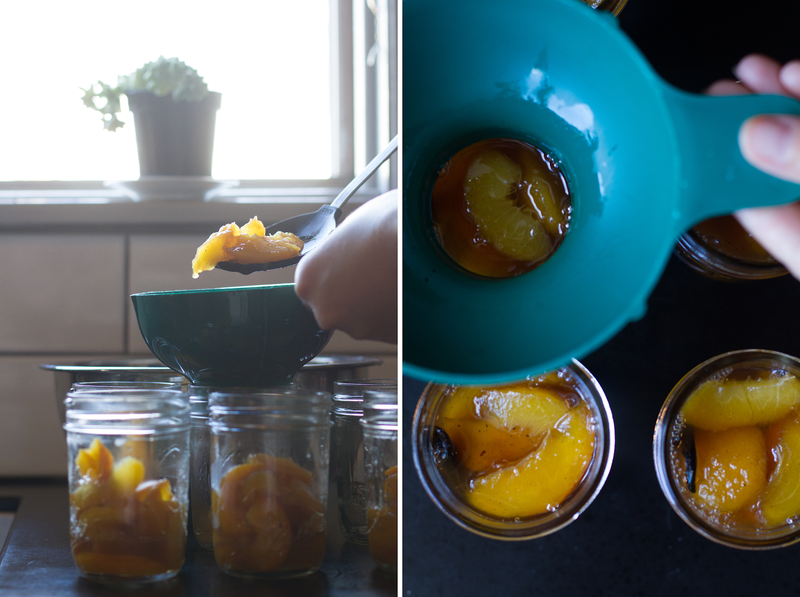 ladle additional syrup on top of peaches and fill jars leaving about half an inch of space from the top. close jars with sterilized lids, and refrigerate until ready for use. they'll keep in the fridge for about a month, but you'll find they won't last long! 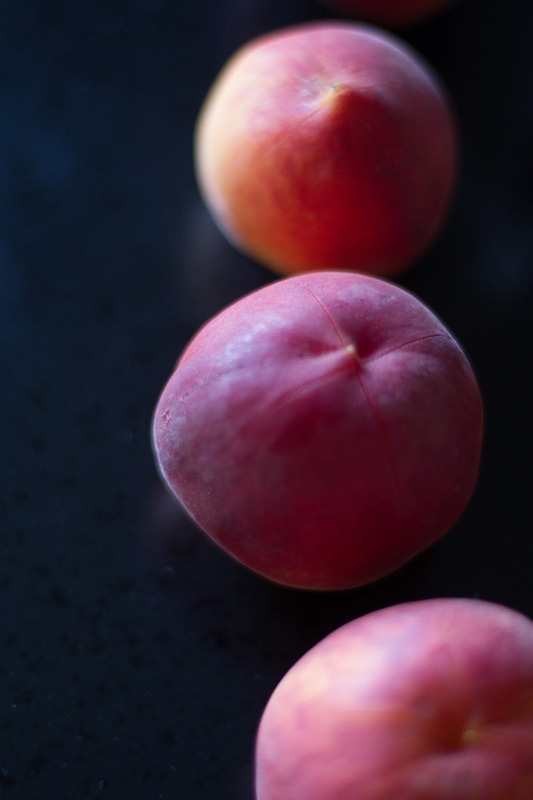 these peaches taste amazing over vanilla ice cream, or just on their own as a delicious little treat. leftover syrup can be used in drinks, lemonades, frozen popsicles, or anywhere you would use flavored simple syrup.